What you will see most of the race- runners and grapevines. 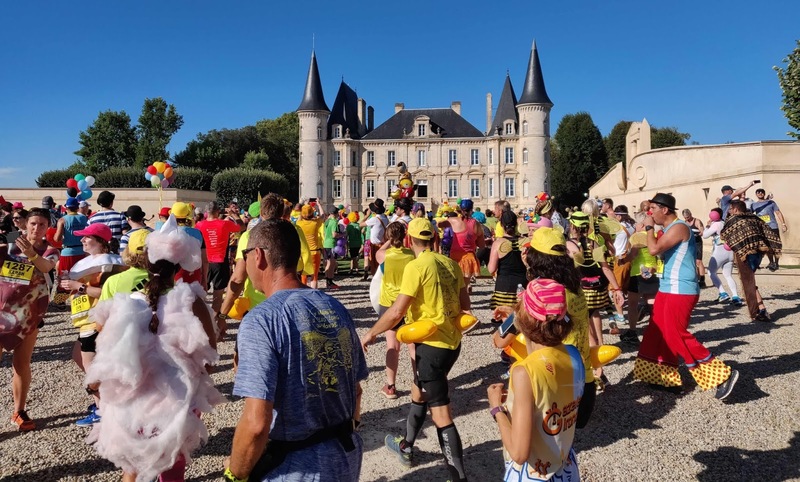 Have you ever heard of the Marathon du Medoc? This no-pressure race was the first in my 4x4 challenge. It is quite famous in France, as well as among the international running community, for its unique format. 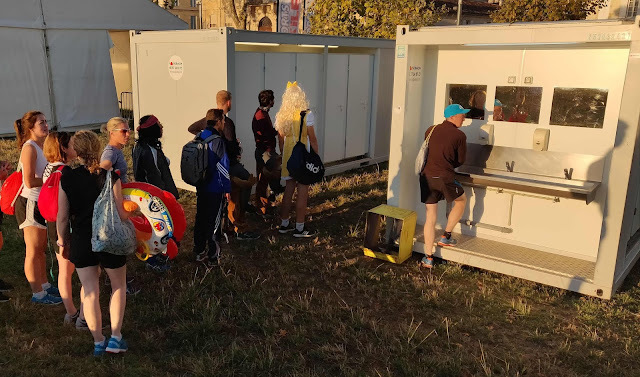 Fancy dress (costumes) are mandatory and wine it offered alongside water at all the refreshment stations. Many of my London running friends have done it before. A group of them had a spare place which gave me the opportunity to run the race this year. I love to explore new places by taking part in running events. This trip was no exception. It seems a bit odd to be running on these gorgeous estates, but hey ho. Race entries and fees: This is by no means a cheap race. Registration was about €80, which included a really nice technical running t-shirt (women- size up as the women's cuts is extremely form fitting), small branded drawstring bag, food and wine along course, "lucky dip" bottle of wine from one of the wineries along the course in a really nice wooden box, a cooler bag, finishing line rose for female finishers, a plastic cup for the after party, medal, and more food and drinks after the finish. Add on top to the cost of the registration fee the transportation and accommodation costs, especially if you decide to stay in Bordeaux rather than Pauillac. Course and bogs: The course starts along the Pauillac riverside and winds through the vineyards of the Medoc region. Some of the course is paved and some on loose gravel and dirt. The start is a bit conjested due to the narrow town streets and plenty of runners but people start to spread out after the first and second wine stops. Of course, the scenery along the scenery is a very pretty due to the surrounding vineyards. We were spoiled by blue skies and sunshine too. There are plenty of toilets in the start area compared to the number of entrants. I was really disappointed at the number of port-a-loos along the course through. There was a lot of peeing on the vineyards, which looked funny when several men dressed the same lined up adjacent rows. The bag drop was a bit of a faff as all bags were searched, then a label was handwritten by someone else and attached before the bag was placed in a big trolley. Later, you collect your bag, they look at your bib for your number, then asked you in French 'what color your bag was' (I think) and dug through a large pile of bags. Few members of Team FOOD! Location: Pauillac France, about an hour drive north of Bordeaux. You can fly direct to Bordeaux or take a train to Paris, then another to Bordeaux. From Bordeaux, there are occasional trains, a local coach (bus) service or the marathon has a private shuttle service organized too. Each option runs at a specific timetable which you should check before booking. Half of our group took trains via Paris and the other fly to Bordeaux. Atmosphere: Was absolutely amazing! Everyone at the start line was happy and relaxed with the goal of having a good time. So many people from the local community were out too, both cheering us on and volunteering at the numerous refreshments stations. Many people put picnic tables out along the road and were enjoying meals as we ran by. Race bling and goody bag: Last year's medal was in the shape of a guitar because the theme for the race was music. This year's theme was amusement parks. The medal was round and had the roller coaster logo in the center. Race 1 of my 4x4 challenge done! After you get your medal and bottle of wine, you can enter the after party tent, where there is more wine, beer, and snacks. We were a bit rushed for time at the end because we wanted to make the shuttle bus back to Bordeaux. Thirty minutes was enough time to have a few drinks before hopping on a hot bus and getting stuck in traffic. At least no one from our group got sick, unless some of the other passengers. Plan ahead. Accommodation is very limited in Pauillac. There are shuttle buses and trains but you need to book in advance. Pay attention to the booking cut off dates! Add a day or two on to your trip and enjoy Paris (especially if you have never been). Matt and Pippa ended up slowly cutting off bits of their costume along the way. Consider how hot and heavy your costume will be. 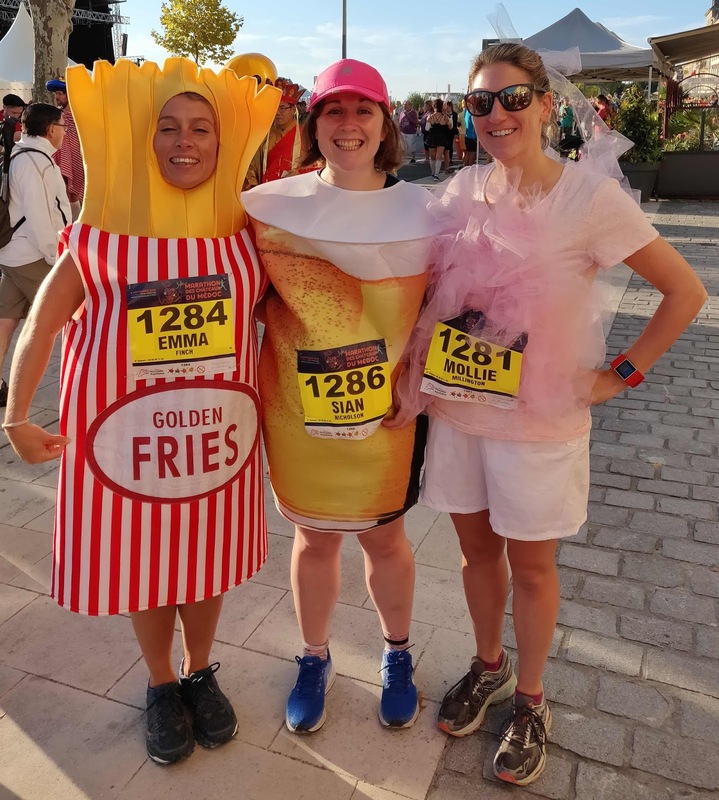 If you are running with friends, matching costumes might make it easier to spot each other in the crowds. I was surprised to see that not all costumes were related to this year's theme. There were lots of minions and Disney characters. You can be as creative as you want. Don't forget you will be running a marathon. 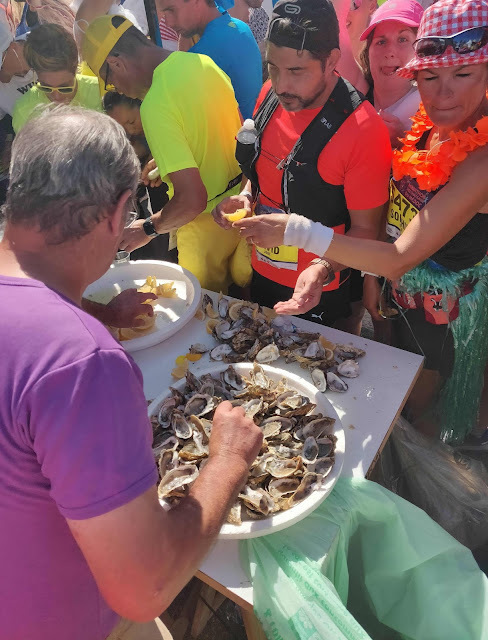 It is easy to get caught up in the other details for this event but you will be on your feet for about 6 hours if you enjoy the refreshment stations. You can take it at a party pace but it is still a lot of time on your foot. Oysters, steak and ice cream are available at the last few refreshment stations. The race website is extremely hard to navigate. The translations are poor which can be frustrating when you are trying to find the answer to something (like when the shuttle buses are). Pack medication for tummy troubles. Basically, we broke all of the normal pre-race rules by drinking the night before the race, staying up late the night before the race, and eating different foods like rich cheese and wine. I was suffering a bit from stomach issues on the course and wasn't able to find an open pharmacy over the weekend until 11pm on Sunday night in Paris. It was not ideal. Bring your friends and make some new ones along the way. There is plenty of time to meet other runners at the pasta party, race, and after party. Stay hydrated! We had unseasonable temps this year. 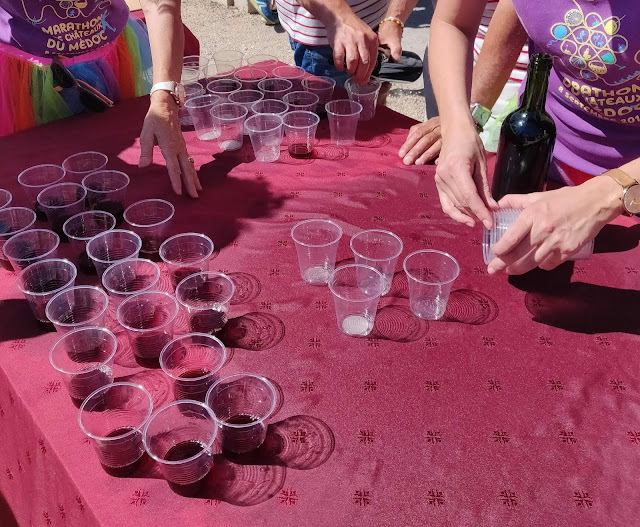 Although you only get a few shots of wine at each refreshment station (I wasn't even buzzing at the end of the race), keep drinking water along the way. 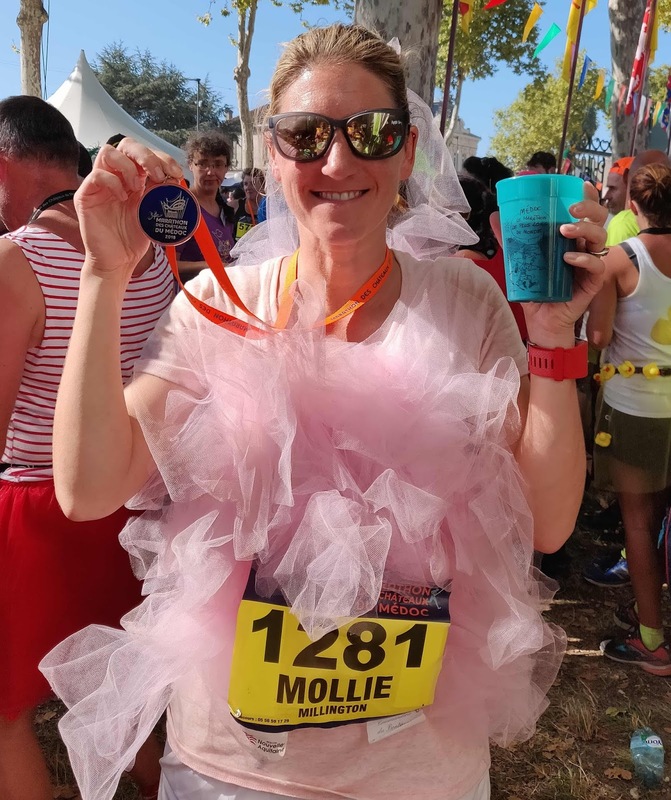 Have you ever completed Marathon du Medoc or something similar? Let me know in the comments below. Post script: My teammate, Melanie, says she likes the little quirks of the race (website, bag drop, transport) and thinks is what makes it more of an adventure. I say there is a race out there for everybody! One of the large ducks we had to avoid being run over by. Thanks to Simplyhealth for sponsoring my 4x4 challenge. If you enjoy living an active lifestyle, check out their new Active Plan.